The BTI Client Service 30 keeps putting more distance between themselves and everyone else. But, as in prior years, certain law firms manage to leap frog a whole group of competitors and land a spot in the BTI Client Service 30—knocking out others. Client service performance is dynamic, absolute, relative, and a source of real advantage—all at once. The leap into the Top 30 is always the result of a set of strategies and tactics to improve client service—all having management backing and teeth (otherwise known as accountability, metrics, and funding). We can see the firms improving in the years prior to joining the best-in-class firms—moving steadily up the curve. Jones Day is ranked number 1 in client service more than any other law firm for an impressive 11 out of 18 times. 2019 also marks Jones Day’s 3rd year in a row at number 1—a feat only accomplished when all the partners successfully work, firmwide, to improve all the time with every client. Skadden is ranked at number 2 for the 2nd year in a row. Latham, DLA, Gibson Dunn, and Hogan Lovells all moved up to fill out the top 5—presented in rank order. Each member of the BTI Client Service 30 takes their own approach to client service. You can see it built into the culture and the behaviors. You can learn the client service strategies and tactics used by the BTI Client Service 30 here. You can see where your firm stands by ordering your copy of the BTI Client Service A-Team 2019: Survey of Law Firm Client Service Performance, which includes a custom comparison of your firm with up to 8 competitors of your choice. This report is the only place you can learn exactly where your firm improved and where a competitor may have improved more—and recommends exactly what to do about it. BTI has been helping our clients design and implement the most effective client service and business development programs in the world for 30 years. We welcome the opportunity to discuss how to improve your performance. Please join me in congratulating the BTI Client Service 30 for 2019. Product Liability Litigation can frequently turn into high-stakes work, but most organizations facing these types of potential issues are trying to minimize and avoid damage well before a full litigation trial develops. Clients are skilled in assessing risk and look for alternative fees to match. Clients want law firms who can assess and understand the exposure associated with product—and hire the firms who adjust their approach to match the risk. You can learn more details about the best opportunities, how client expectations are changing, and the 51 law firms clients recognize most in Product Liability Litigation in the just released BTI Litigation Outlook 2019. You can also learn why clients recognize 8 firms as leading the market. Please join me in congratulating the Powerhouses and Standouts. Learn more about the firms clients singled out for Product Liability Litigation prowess in the newly released BTI Litigation Outlook 2019. Employment Litigation will effectively stay even with 2018 spending. Although, the faster growth is in the large and complex matters. Clients are paying more for these larger assignments. Clients report continued need in the less complex segment of the market as well. Clients want to be able to manage their complex cases while managing the everyday work under alternative fees and delivery structure. Look for opportunities in Banking, Energy, Financial Services, and 4 other industries. You can learn more details about the best opportunities, how client expectations are changing, and the 79 law firms clients recognize most in Complex Employment Litigation in the just released BTI Litigation Outlook 2019. You can also learn why clients recognize 5 firms as Complex Employment Powerhouses—and 21 firms as Complex Employment Standouts. Please join me in congratulating the Powerhouses and Standouts. Learn more about the firms clients singled out for Complex Employment Litigation prowess in the newly released BTI Litigation Outlook 2019. More companies are facing commercial litigation matters than last year. Most of the increase is coming from the soaring rates of high-stakes matters—which is also putting pressure on the routine work. Look for growth in Consumer Goods, Food, Insurance, and Transportation. 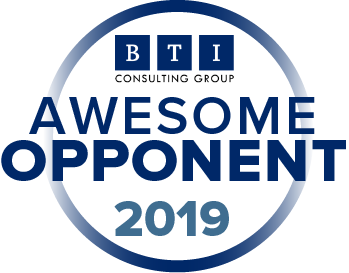 You can learn more details about the best opportunities, how client expectations are changing, and the 80 law firms clients recognize most in Complex Commercial Litigation in the just released BTI Litigation Outlook 2019. You can also learn why clients recognize 5 firms as Complex Commercial Powerhouses—and 23 firms as Complex Commercial Standouts. Please join me in congratulating the Powerhouses and Standouts. Learn more about the firms clients singled out for Complex Commercial Litigation prowess in the newly released BTI Litigation Outlook 2019. After a flurry of new activity in 2018, the percent of large organizations handling Securities and Finance litigation dips back to 2016 levels. The companies still managing these matters plan to increase their spending in 2019—driving moderate growth for this segment of the litigation market. 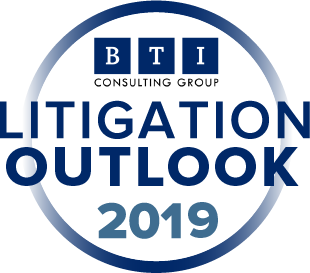 You can learn more details about the best opportunities—by industry—and how client expectations are changing in the just released BTI Litigation Outlook 2019. You can also learn why clients recognize 5 firms as Securities and Finance Powerhouses—and 11 firms as Securities and Finance Standouts. Please join me in congratulating the Powerhouses and Standouts. Learn more about the firms clients singled out for Securities and Finance Litigation prowess in the newly released BTI Litigation Outlook 2019. More than half of large organizations face class actions each year. What is different is the number of class actions a large organization manages in a year—this is noticeably on the rise. Combined with an increase in exposure of each of these cases, you have the all the conditions necessary for growth. You can learn more details about the best opportunities, how client expectations are changing, and the 82 law firms clients recognize most in Class Actions Litigation in the just released BTI Litigation Outlook 2019. You can also learn why clients recognize 4 firms as Class Actions Powerhouses—and 22 firms as Class Actions Standouts. Please join me in congratulating the Powerhouses and Standouts. Learn more about the firms clients singled out for Class Actions Litigation prowess in the newly released BTI Litigation Outlook 2019. IP Litigation is poised to be the fastest growing segment within Litigation at 5.15% in 2019. The number of companies expecting significant IP Litigation dropped slightly. Increased spending plus fewer matters equals higher hourly rates and larger spending on each matter. These dynamics offer law firms opportunities to develop bigger relationships—more than offsetting the drop in companies with IP Litigation needs. Look for the biggest increases to come in Chemicals, High Tech, Manufacturing, and Pharmaceuticals. You can learn more details about the best opportunities, how client expectations are changing, and the 53 law firms clients recognize most in IP Litigation in the just released BTI Litigation Outlook 2019. You can also learn why clients recognize 7 firms as IP Litigation Powerhouses—and 11 firms as IP Litigation Standouts. Please join me in congratulating the Powerhouses and Standouts. Learn more about the firms clients singled out for IP Litigation prowess in the newly released BTI Litigation Outlook 2019. Advantage goes to the feared. Good strategy stops others from acting before they start. The most feared firms make their opponents either stop or change what they are doing. Feared firms have the upper hand as the opposing side is reacting to your changes—meaning you can better drive the process. The most feared law firms will do things their opponents don’t expect. Until just 2 years ago, clients felt like they could anticipate the strategy opposing counsel would take—no more. The Fearsome Foursome and other feared firms stand out for their new, unexpected, and winning strategies. These feared client teams want to start off with a show of force. They bring a lot of talented attorneys to bear early and come on strong. This initial surge lets the other side know they are in for a bigger fight than they ever dreamed—and their client is wildly committed to getting the outcome they want. It may cost more, but clients are convinced it’s the cheapest way to go over the life of the matter. The most feared law firms cut through complexity swiftly and decisively. This is a real advantage as complex matters are the fastest growing segment of the litigation market. Fearsome firms are unrelenting in meeting their client’s goal—and their behavior lets everyone know of their unmatched commitment—including the opposing side. The BTI Fearsome Foursome—the most feared law firms in litigation. The BTI Awesome Opponents—these firms are nipping at the heels of the Fearsom Foursome. Being Fearsome is one the biggest differentiators in the market today. The number of Fearsome Firms is shrinking; meaning the more Fearsome your firm, the more you stand out, to clients and the other side. It is the Fearsome firms who have nothing to fear. Learn more about how your firm can take advantage of how client behavior and spending is changing for 2019—and what your firm can do to adapt, in the new BTI Litigation Outlook 2019: Changes, Trends and Opportunities for Law Firms. Available now. Top legal decision makers have a time-honored code—they will recommend the law firms doing a much better job than anyone else. Even the most contentious competitors will share these recommendations for one simple reason—each one knows they could easily face a high-cost-of-failure circumstance—and want to know what the best options are. Their best and most reliable source of this law firm intelligence is the unprompted recommendation from a peer. The peer-to-peer recommendation is serious business. Every recommendation is a personal statement about the type of provider—the commitment, service, quality, and demeanor—you are willing to entrust to a peer—from whom they would expect the same. We discuss this in more detail here. Your law firm’s recommendation rate—how often your clients recommend you to their peers in an unprompted manner—is one of the most powerful indicators of future growth potential and sustainable business development. More than half of corporate legal decision makers will hire a law firm based on a single, unprompted recommendation from a peer. You can learn who the remaining 79 most recommended firms are by downloading our complimentary report BTI Most Recommended Law Firms: The Law firms Legal Decision Makers Recommend 2018. Earning recommendations is no passing honor. Recommendation rates are one of the most powerful indicators of future growth potential—clients think highly of you—a real advantage when pitching or quietly developing business with your best clients. Learn about the drivers behind recommendations and why they are so powerful in our no-cost report or here. Clients are slimming down the list of firms to whom they pay their highest rate. This can help explain why the top rate hasn’t budged in 3 years—at a lofty $2,000 an hour. And, only 56% of clients say these firms are truly worth it. Clients pay the highest rates when they need deep insight, understanding, and unflinching confidence in the ability to deliver. This presumes the firms bring unique knowledge and understanding of the risk. The following firms stand out above all others for: 1) Being identified as the firm clients pay the highest rate; 2) Clients sharing this high rate with BTI; and 3) The firm was well worth this highest rate. The above firms are part of the BTI Client Service 30—the law firms clients single out for delivering the best client service. As more clients pay more law firms their highest rates, their expectations will soar along with these rates. As complex work grows, look for clients who want you to look high-rate ready—especially since more and more matters are morphing from complex to bet-the-company midstream. Every relationship partner can start adopting the top-rate behaviors at any time—this will give you practice for when the big day comes—and just might get you happier clients at premium rates. You can see the list of all firms earning the highest rates in our newest report BTI Highest Rate Firms 2018. Order your complimentary copy here. *Based on BTI research conducted between September 2017 and January 2018. BTI conducted more than 360 independent, individual interviews with top legal decision makers at large organizations with $1 billion or more in revenue. Clients have been on the receiving end of a continuous stream of increasingly complex risk and exposures. This stream of complexity is in its 4th year and shows no signs of abating. And, it’s changing what clients want in their law firms. With equal parts tenacity, sheer will, smarts, and intuition—combined with confidence, savvy, conviction, and the nerve to go for the jugular—these cutting-edge law firms have the killer instinct clients want right now. Clients see killer instinct as the secret sauce to get to the right answer faster. Most importantly, clients are willing to pay more for killer instinct because their total cost will be lower. This has been a long time coming—but inevitable. Clients want better results and want value. Killer instinct solves this problem—and more. You can study the entire group of killer instinct firms and all those who stand out for traditional and new aspects of client service in the just released BTI Client Service A-Team 2018: Survey of Client Service Performance for Law Firms. To some killer instinct comes naturally while others learn to develop it. Clients want it from you now—and they are paying premiums to get it. We also note the 4 firms above are the only law firms corporate counsel rank Best of the Best in all 17 activities driving client service. Jones Day and Dentons have delivered on all 17 best-in-class cylinders for 2 years in a row. Jones Day, Morgan Lewis, and Sidley show unmatched commitment—and success—in continually improving client service. These 3 are the only firms to land a coveted spot on The BTI Client Service 30 in all 17 years BTI has been conducting the research. Every firm on The BTI Client Service 30 has been here before—for an average of 8 times. They all have ongoing client service programs, as compared to so many firms who start a client service initiative and then change to a new initiative after a year is up. Superior performance demands client service improvement be a permanent part of daily life. This year, top legal decision makers report superior client service is all about client-facing programs. We heard about dedicated client teams, law firms seeking out client feedback, industry knowledge, and deeply customized educational tools and sessions. We also heard how firms in The BTI Client Service 30 have become much more sensitive to the need for budget certainty—and are delivering. You can learn the client service strategies and tactics used by The BTI Client Service 30 and see where your firm stands by ordering your copy of the BTI Client Service A-Team: Survey of Law Firm Client Service Performance, which includes a custom comparison of your firm with up to 8 competitors of your choice. This report is the only place you can learn exactly where your firm improved and where a competitor may have improved more—and recommends exactly what to do about it. BTI has been helping our clients design and implement the most effective client service and business development programs in the world. We welcome the opportunity to discuss how to improve your performance. Please join me in congratulating The BTI Client Service 30 for 2018. Follow the money. The money will always tell you the story. This money is going back to outside counsel. Flying right into the face of conventional thinking after 7 years of watching clients bring work in house—it’s going right back out again to outside law firms. But, how it’s going and to whom, is as different as ever. Top legal decision makers are able to keep balanced budgets despite using high-priced outside counsel by using new budget and buying strategies. Clients are able to buy more services for the same dollars with the help of their new Chief Legal Operating Officers. This new group is already helping to buy smarter and get more outside counsel for the buck. In addition to CLOO savings, large clients continue to embrace AFAs—with fixed fees being the arrangement of choice. General Counsel are also using the savings from the large number of settlements they reached (litigation settlements hit a record in 2017) to fund their newfound spending with outside counsel. And clients have only started to push hard on these fronts. Clients are picking and choosing their law firms based on their enthusiasm and prowess in these buying strategies. Any sign of law firm resistance, even if unintended, will make your firm look much less attractive than those embracing the new way of GC living. Our research with top legal decision makers shows this shift has been in the making for the past 18 months. Corporate counsel can’t scale their departments fast enough to meet the needs of the increasingly complex work coming in the door. They also want to tap a broader range of skills than they can keep on staff. This is a fundamental change in their approach from the last 6 years. Overall, clients plan to move $3 billion of in-house budget to outside law firms in 2018. You can pinpoint where each and every practice will grow and command higher rates in the newly released BTI Practice Outlook 2018: Changes, Trends and Opportunities for Law Firms.